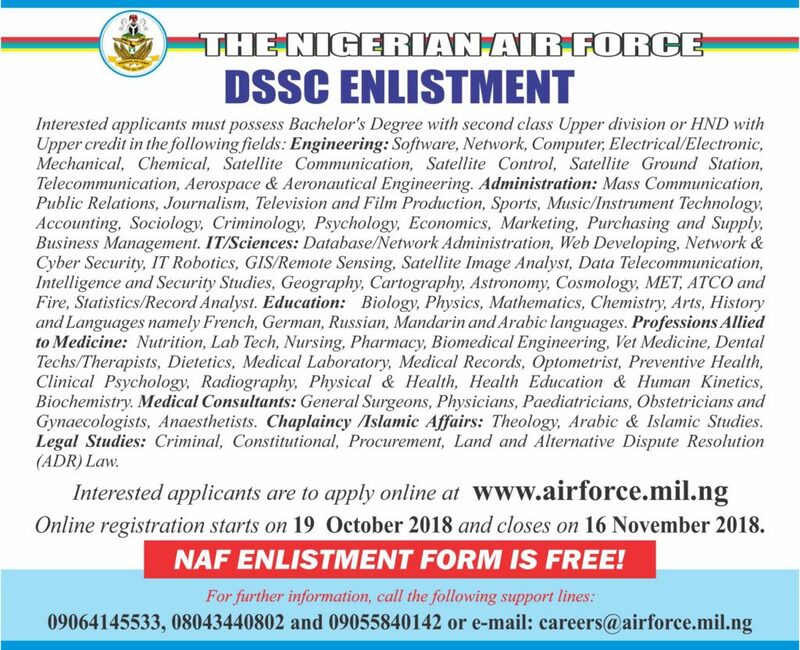 Nigerian Air Force Direct Short Service Cadets (DSSC) Recruitment form for the year 2018. Online Registration starts on 19 October 2018 and closes 16 November 2018. Application is free!!! The Nigerian Air Force (NAF) is enlisting graduates and post-graduates for training as Direct Short Service Cadets. Nigerian Air Force DSSC Recruitment Eligibility. Nigerian Air Force DSSC Recruitment Qualifications. a. Engineering: Software, Network, Computer, Electrical/Electronic, Mechanical, Chemical, Satellite Communication, Satellite Control, Satellite Ground Station, Telecommunication, Aerospace & Aeronautical Engineering. b. Administration: Mass Communication, Public Relations, Journalism, Television and Film Production, Sports, Music/Instrument Technology, Accounting, Sociology, Criminology, Psychology, Economics, Marketing, Purchasing and Supply, Business Management. c. IT/Sciences: Database/Network Administration, Web Developing, Network & Cyber Security, IT Robotics, GIS/Remote Sensing, Satellite Image Analyst, Data Telecommunication, Intelligence and Security Studies, Geography, Cartography, Astronomy, Cosmology, MET, ATCO and Fire, Statistics/Record Analyst, Physical & Health, Health Education & Human Kinetics, Biochemistry. d. Education: Biology, Physics, Mathematics, Chemistry, Arts, History and Languages namely French, German, Russian, Mandarin and Arabic languages. e. Professions Allied to Medicine: Nutrition, Nursing, Pharmacy, Biomedical Engineering, Vet Medicine, Dental Techs/Therapists, Dietetics, Medical Laboratory science, Medical Records, Optometry, Preventive Health, Clinical Psychology, Radiography. f. Medical Consultants: General Surgeons, Cardiothorasic Surgeons, Artorpedic Surgeon, Physicians, Paediatricians, Obstetricians and Gynaecologists, Anaesthetists. g. Chaplaincy /Islamic Affairs: Theology, Arabic & Islamic Studies. h. Legal Studies: Criminal, Constitutional, Procurement, Land and Alternative Dispute Resolution (ADR) Law. CANDIDATES WITHOUT ANY OF THE ABOVE LISTED QUALIFICATIONS ARE NOT TO APPLY. How to Apply for Nigerian Air Force DSSC Recruitment. Interested applicants are to apply free of charge online at www.airforce.mil.ng. Please sir /ma. I’m interested but don’t know how to apply… Please keep me updated my Email is.